The Uruguayan department of Colonia is in the Río de la Plata region and is home to the second oldest city in the country, Colonia del Sacramento. Colonia is also the department’s capital and the leading producer of dairy products in the country. Because of its proximity to Buenos Aires and its accessibility via the Río de la Plata, Colonia is the primary entry point for tourists entering the country from Argentina. On a small peninsula in southwestern Uruguay is the city of Colonia del Sacramento. It sits on the coast of the Río de la Plata, and just across the river from it is Argentina’s large, teeming capital, Buenos Aires. Colonia having been occupied by both the Portuguese and the Spanish, its Barrio Historico presents a unique street plan, with the Portuguese section characterized by irregular, cobblestoned, terrain-fitting streets and the Spanish part by wider, orthogonal streets. Because of its well-preserved colonial streets and buildings, Barrio Historico is a designated UNESCO World Heritage Site. 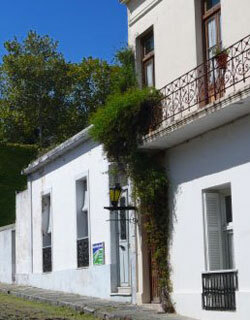 A number of sites of interest are in the tree-lined Plaza Mayor. These include the city’s gate and wooden drawbridge, Portón de Campo, the Portuguese and Municipal Museums, the early 19th century Basílica del Santísimo Sacramento, and Iglesia Matriz, the oldest church in Uruguaybuilt in the last years of the 17th century. Two examples of restored and preserved old houses here are the Casa de Nacarello and the Casa del Virrey.